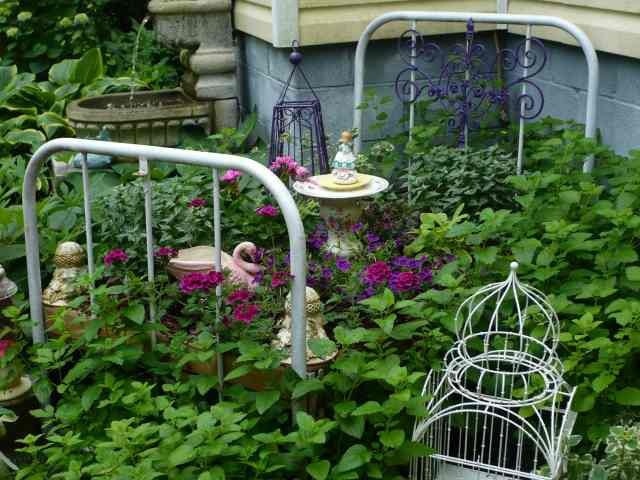 Many items commonly identified as junkyard fodder can be salvaged and converted into unique decorations around your yard. In doing so, these aged possessions stand proud as personal relics in which you can fondly look upon with cherished memories. Cars can, for example, be filled with living hood ornaments, just as the one above. 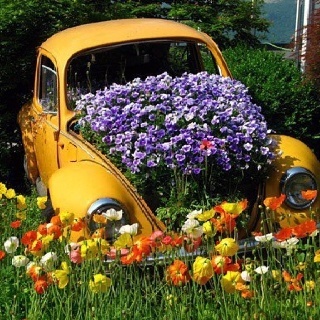 If you have a working car that isn’t in use, you can fill the trunk with plants instead, creating a portable garden that you can cruise through the neighborhood like your own, personal parade float showcase. Though a crown of blooms is just as fetching. Along with the dresser, other bits of ‘junk’ are also utilized, from vases to shipping boxes. Add some baskets and orchard barrels into the mix to further play on the interest of dimension. 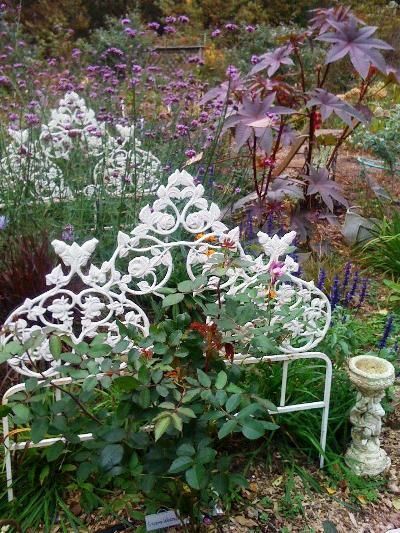 Take your flowerbed literally by erecting a fence made from an old bed-frame. Here is the same concept from a different angle. For all things too small to stand alone as sculptural works, such as bits of broken glass and tiles, you can create custom mosaic stepping-stones. It is similar to making your own back-splash. If you have any old buckets, cut the bottom off and use it as a mold for your stepping-stones. Cake pans will also work. In addition to your decorative junk bits, you’ll need wet cement as the stone’s foundation. When ready, begin by spraying your mold with cooking spray. Next, place small discarded items on the bottom of the mold, marbles and shells make great additions for this. Now, fill the mold with the wet cement and allow to harden. If you really want to get experimental, you can either buy mold in novelty shapes or create your own. When it has finished drying, the stepping-stone should pop out of the mold and be ready for use as a guide in your garden. 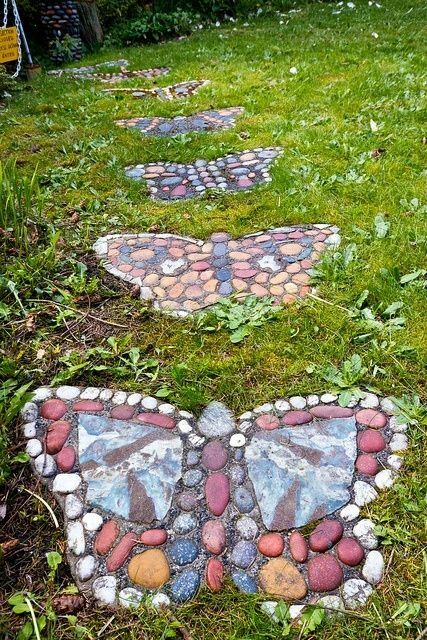 If you don’t want to mess around with cement, you can still make a whimsical foot path to meander through your yard. Simply clear enough grass from your desired path-space to leave the dirt exposed. You’ll want to ensure the roots have been completely removed, lest you have green patches popping up within your path. But this isn’t a problem so long as you find the sparse and spotty look charming. With your path cleared, you can now begin to decorate. Adorn the ground with the same ‘junk’ bits described above, making sure they are embedded well enough to stay in place. 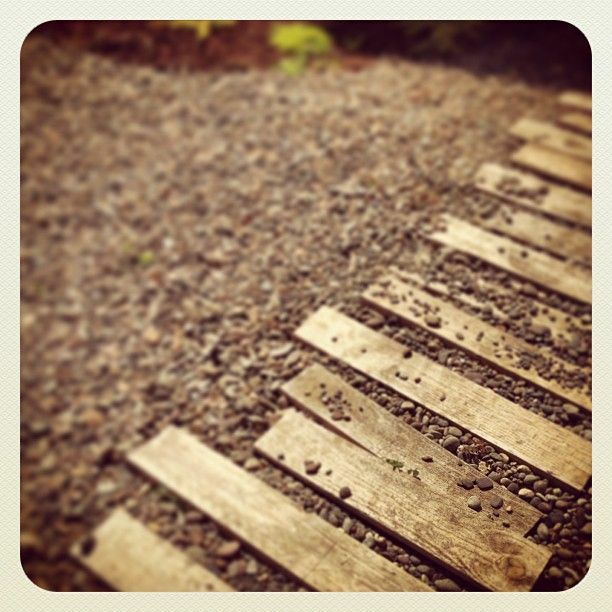 Or, for a more rustic alternative, lay down old wooden planks. 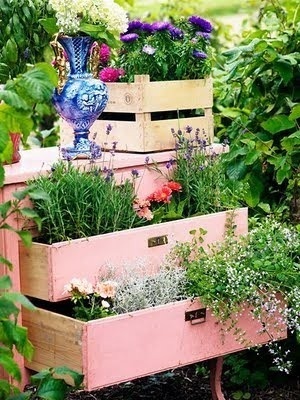 If you don’t already have some on hand, you can make your own from shipping pallets.